One of the most critical ways that individuals can influence governmental decision-making is through voting. Voting is a formal expression of preference for a candidate for office or for a proposed resolution of an issue. The Universal Declaration of Human Rights, adopted unanimously by the United Nations General Assembly in 1948, recognizes the integral role that transparent and open elections play in ensuring the fundamental right to participatory government. The term ‘free and fair’ becomes important catchphrase to explain the standards of democratic election and to measure the success of an election. Normally this term include the requirement that an election must be periodic, sustainable, transparent, and genuine. Besides the fact that the terms like ‘free’ and ‘fair’ have no easily verifiable content and often being used subjectively, they have been accepted as the simplest way to explain complicated and so much debated standards of democratic elections. The Universal Declaration of Human Rights in Article 21 states: Everyone has the right to take part in the government of his/her country, directly or through freely chosen representatives. Everyone has the right of equal access to public service in his country. The will of the people shall be the basis of the authority of government; this will shall be expressed in periodic and genuine elections which shall be by universal and equal suffrage and shall be held by secret ballot or by equivalent free voting procedures. The term not only widely used by popular mass media, but also widely referred to in scholarly writings and some formal documents. Started with Gill’s works in 1994, the term ‘free and fair elections’ seems to be more precise and extensive terms for electoral benchmark compared to the other terms such as ‘periodic and genuine election’ and ‘free election’. According to David Beetham the principle that elections in a democracy should be ‘free and fair’ is now established, as there are also the international standards governing what this means in practise. The term has been officially used in an international document in 1994, when the Inter- Parliamentary Union (IPU) adopted the Declaration on Criteria for Free and Fair Elections. The declaration affirms that in any state, the authority of the government can only derive from the will of the people as expressed in genuine, free and fair elect ions held at regular intervals on the basis of universal, equal and secret suffrage. Generally, “free and fair elections” refers to periodic, genuine, clean, transparent, free and fair, competitive elections that in compliance with the principle of democracy, human rights and natural justice. A free election implies that all citizen including electors, parties, candidates and media enjoy all their fundamental rights. These rights including the freedom of expression, association, movement and assembly; freedom from intimidation and violence; freedom of access to and by electors to transmit and receive political and electoral information messages; freedom of access to the poll. Fair election ensure that all candidates and parties to compete on a basis of equal and impartial treatment under the law and by the authorities. It also necessitates a level ‘playing field’ in enforcement election-related law, access to state facilities and media. Under this principle, there should be a clear separation between the state and political parties, and public facilities and resources should not be used unfairly to the benefit of one party. Fair election also protects all citizens’ rights to universal and equal suffrage; and rights to vote by secret ballot. The election management body should be credible, independent, non-partisan and should be able to conduct their affairs with impartiality and a maximum of transparency. situation in Bangladesh that causes the threat to life, liberty, security, economy and violation of human rights. • Election roll rules (2008). Thus, when all the four variables mentioned above will be available in the process, conduct and outcome of an election, that election could be considered to be free, fair and credible. Independence of EC is another criterion of the free and fair election. In theory, the EC of Bangladesh is very independent as constitution and RPO. However, in practice, it has been noticed that the EC is not free and fair enough under the ruling government from the independence of Bangladesh. Even, some local government elections the EC including some political parties demanded army deployment to the government so that election can be held under the sound law and order situation. The deployment of the army also needed to protect and ensure the security of voters. But the government did not supply the army and a lot of incidence of violence and brings happened in the city corporation elections in Bangladesh. The last national election held on 5th January 2014 the EC and government failed to ensure the security of voters and violation of human rights before and after the election. Therefore, another element of free and fair election is the security of voters must be ensured before and after the election has been violated severely. The impartial and neutral practice of election administration is another important feature of free and fair elections. In Bangladesh, though legal instruments of the electoral process are very strong to deal fairly as an institute but in practice, the EC and election administration is not neutral and independent enough and dominated by the government. Besides these, a competitive election among all parties and impartiality of acting government are not ensured except four elections held under Care-Taker-Government in 1991, 1996, 2001 and 2008.
political parties is one of the vital problems in Bangladesh. As a result, lack of reliability in holding elections under ruling government and claim and blame game is going on from the very beginning of independent Bangladesh. 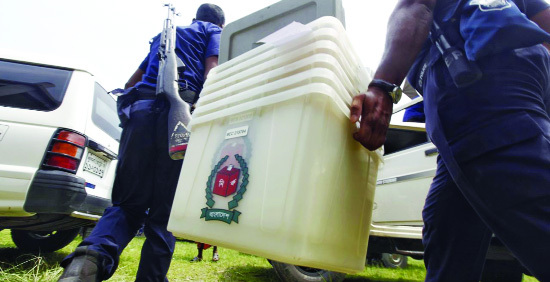 Bangladesh recorded the most unfair election on December 30. The 11th national election was designed under the government of ruling party. On the prior of election, violence erupted due to EC’s lack of control over the election administration, especially at the local levels. Supporters of the ruling Awami League party led by Prime Minister Sheikh Hasina attacked oppositions recklessly across the country. New York-based global rights group Human Rights Watch urged the international community in a statement on December 14 to press the Bangladesh government to create conditions for a free and fair election. The group criticized Bangladeshi security forces for arresting and intimidating opposition figures and threatening freedom of expression ahead of the election. A country cannot be truly democratic until its citizens have the opportunity to choose their representatives through elections that are free and fair. Free and fair elections play a critical role in political transitions by advancing democratization and encouraging political liberalization – helping to promote peaceful, democratic political transformation that lead to increased stability and prosperity. The destruction of electoral system is the destruction of governmental system. According to scholars, lack of democracy and good governance was apparent in the country and it posed a challenge to achieving sustainable development. It was not right to consider development and democracy separately as they were interrelated. Development in some countries, where democracy was absent, had been brought to the fore at times as examples. Such development was neither sustainable nor equality-based, only materialism and consumerism flourished in those countries rather than values and individual freedom. So an unfair election downfalls democracy and breaks the stability of a state.